As you may know, Platform Builder was built with Game Maker Studio 2, a marvelous piece of software by Yoyo Games which is used to develop games (or, in my case, a game-making game). About 5 and a half years ago, I opened up Game Maker, started a new project, named it "Platform Builder," and began working. My first step was to create the game engine, that is, the actual game stuff. Later, I added the builder engine, that is, all the builder stuff. Both of these engines work together to give us Platform Builder, and they have developed greatly since our first release. Today, I'm announcing an important new project. I am preparing to release an open-source version of Platform Builder's game engine. 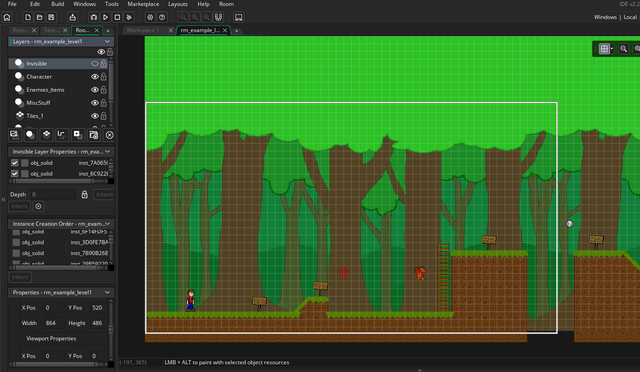 I am calling it the Ultimate Platformer Engine (UPE, for short). My aim is to make it the most powerful and sophisticated open-source platformer engine available for Game Maker Studio 2. With the UPE, anyone could make a Platform Builder game without the limitations of Platform Builder. Everything is there in Game Maker and you have access to all of the source code. One major feature of this engine is that it can run .pbx files. This means that anyone who owns Game Maker can use the Ultimate Platformer Engine to export their games made with Platform Builder. The process could not be any easier. Simply add the .pbx as an included file in your project and export. Done. I know that some of you (probably most of you), are not very fluent with Game Maker Studio 2. And to be honest, it would probably be a waste to buy Game Maker Studio 2 and the UPE just so you can export Platform Builder games. However, if some of you do happen to own these things, I don't mind if you export Platform Builder games for other people. In fact, I hope you do. I have always wanted to give you guys the opportunity to export your games. Now, finally, this could become a reality with the help of Game Maker. By releasing this engine to the Game Maker Marketplace, we also reach a whole new audience. My hope is that more people will hear of Platform Builder through the UPE and become involved in this community. You probably have some questions. Here are some answers. It's very difficult for me to estimate when the UPE will be ready. It is a long and tedious process going through years of code. The tentative plan is to have is available on the Yoyo Games Marketplace within the next view months. I do not have a price determined for the UPE, but I can't give it out for free. There are other platformer engines out there and it would be unfair of me to spoil the market. I also want to be fair to myself and the hard work put into this. Platform Builder isn't going anywhere, but its production will be slowed down as I work on the UPE. In the meantime, I will continue to put out patches as they are needed. This could be big. We'll see. When it comes to marketplace and I see it useful for me. Probably I will buy it! WOW! I can't believe it! I just don't know how to code... And I have never been the coding type, but this will definitely change PB's direction in the future. I may not get to do this, (though I wish I could!) but maybe I could ask Antikore to code up something cool for ASM! Who knows! I love making games and playing them too! Woah. I am actually amazed. Especially because I own GameMaker Studio 2. I know that I've said I was learning it in a much older post but I sadly haven't used it in a long while. This, though, is definitely going to bring me back to learning it. This opens up infinite possibilities. You can literally do anything with the PB engine. I'm super excited about this, I'll definitely be getting it. I will still use PB though, just as much as I do now. Thank you very much, TingThing, for sharing the source code of your amazing engine. And, thank you for adding the feature to export to an executable with this. This really could be big. REALLY REALLY BIG! This will be awesome! Hey TheEpicz1, do you think you could help me create some things in ASM? I don't care for code, and I don't really want to buy studio 2. (I would use it if I could get my hands on it somehow.) It would be cool to be able to aim and shoot projeciles like in a yoshi game. Only, you use the mouse to point. Or use some sort of keys like up and down. I don't know, but anyway, I would love just to poke around in the source code and maybe just play around with sprites, or change values in stuff or something. And Ting Thing, will you have instructions on how to create new commands? That would be EPIC! And I'm a little confused, is this only for PBX's? Or what? I am a little confused from your post that you made in a suggestion topic when I was telling Antikore something. The UPE is the code for the game engine of Platform Builder. You can use is to construct stuff from scratch in Game Maker or you can use it to run and compile .pbx files. If you use it to run and compile .pbx files, nothing is stopping you from tweaking the game engine before it takes on the .pbx file. None of that lets you change Platform Builder, but it will let you change games that you make with Platform Builder. In case of me buying UPE, which GMS2 I will need to buy? Again, I would not recommend purchasing the Game Maker and the UPE just so you can export .pbx files. There will likely be others who can do that for you. But if you are inclined to get all that stuff, you should know that Yoyo Games often runs a couple sales throughout the year for their products. You might be able to get Game Maker on sale. If your sole purpose of getting Game Maker is for the UPE, I would recommend you wait to buy Game Maker until the UPE is released. There's always a 5% chance that the stuff I announce doesn't work out. Thank you. Hope you make UPE great and you get a lot of sales! Does this mean that I cannot create new character abilities and add new stuff to my game? Or does this mean I can add it to my game, but not to PB to put inside my game, I am still a little confused. The UPE contains the code to run your PB games. If you change that code you could change how your PB games are run. Take your pounce move for example. You could create a game in PB that uses ground pounds. But when you import that game into the UPE, you could change how ground pounds work so that the character moves forward during a ground pound. Here's another example. In Platform Builder, you could write a command that says "turbo = true." This wouldn't do anything in Platform Builder because there is no "turbo" command. But you could important that game into the UPE and add a turbo command to the code for the command prompt, and make that command do something. None of that changes Platform Builder. It just changes the code which will run your game. I am the only who has the full code for Platform Builder and the ability to modify Platform Builder and the ability to update Platform Builder on Steam and other websites.